Chris Colabello (right) earned brownie points with GM Terry Ryan with his performance Monday. Just over a month ago on a Podcast, we wondered why the Padres were dealing for Ian Kennedy. Maybe there was some method to their madness after all, as Kennedy has been a much better pitcher since taking his flyball tendencies to Petco Park. Remember that this dude won 21 games in 2011 for the Diamondbacks before regressing last year and then taking an even bigger nose dive this season. Now, Kennedy finally seems headed in the right direction, on Monday earning his first win over an NL West opponent in 12 tries this year. In six innings, he held the Giants to five hits and one run, fanning seven. Yes, it’s only the Giants, but Kennedy definitely looks like a different pitcher since arriving on the coast. In four starts at Petco, he’s won three times and in his second start as a Padre he looked splendid in a no decision in Cincy – a very tough park for hurlers. Maybe it’s time to give Kennedy another look for Fantasy purposes, especially if you need a bit of pitching help to get you over the hump for the final few weeks of the season. Even through his suckitude in Arizona, he maintained a very strong strikeout rate, and now that his ERA and WHIP are headed in the right direction, Kennedy can again be a very useful Fantasy asset. Back in late-May, we wrote about how outfielder Chris Colabello was demanding a look in the majors with his work at Triple-A. 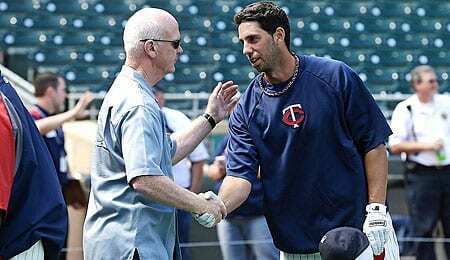 Well, he’s getting that shot now, and while he’s struggled to get on base in the majors and is really an afterthought in right field for the Twins with Oswaldo Arcia ticketed as the long-term answer, Colabello made some serious noise Monday. He spanked two dingers, the second of which was a go-ahead grand slam in the top of the ninth. The Yankees haven’t exactly been on fire lately, but their win Monday allowed them to move ahead of the Indians and pull within 2.5 games of the Wild Card leaders (a three-way tie between Texas, Oakland and Tampa Bay, the first two of which are battling for the division crown, so only the loser will be a part of this race). The Yanks have 25 games to make up the difference, but given that three of them are against the Rays, they technically still control their own destiny. Now it’s your turn. Can Ian Kennedy get back to his 2011 form? Let us know in the comments below. Crave more in-depth Fantasy analysis? Then join us every Thursday at 9 p.m. EST for RotoRob’s Fantasy Baseball Weekly Podcast on Blogtalkradio. Tim McLeod and RotoRob will entertain and edify you for a half hour or more each week. Tune in here. This entry was posted on Tuesday, September 3rd, 2013 at 10:55 am	and is filed under BASEBALL, Fantasy Notes, RotoRob. You can follow any responses to this entry through the RSS 2.0 feed. You can leave a response, or trackback from your own site.